Any product used in the food and beverage industry needs to satisfy highest standards of hygiene. At the same time, the gentle handling of liquids and highly viscous fluids is an important quality criterion. 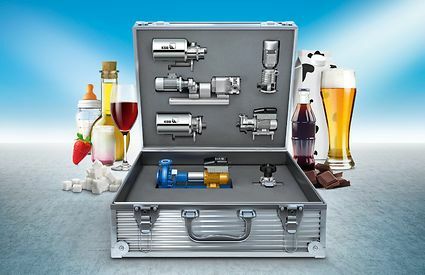 High-quality materials suitable for hygienic applications, CIP and SIP capabilities make KSB pumps and valves the key components of any sterile process. KSB pumps and valves – built to ensure total hygiene. Equipment used in the food and beverage industry not only needs to ensure sterile processes. The components must also satisfy stringent requirements in terms of reliability and profitability. This is the only way to ensure our position in a highly competitive market. To this end, KSB has at hand a wide range of products and services to offer its customers bespoke all-in solutions from a single source, which are tailored to the respective process – including support during the planning stage right up to after sales.